With #CSW61, together with hashtags connected to all of the side events taking place, you can follow tweets from the event and discuss women’s economic empowerment in the changing world of work with thousands of participants. You can also access the latest information on logistics, the official session and the side-events through @UN_CSW on Twitter and UN_CSW on Facebook, and even follow stories on unwomen Snapchat and Instagram. Patricia Arquette who spoke about gender equality in her Oscar speech 2015, has teamed up with soccer player Abby Wambach to bring awareness about the gender pay gap and supporting legislation that equalizes pay. Togeather with UN Women Executive Director, Phumzile Mlambo-Ngcuka, Arquette launched the hashtag #StopTheRobbery which centers around the idea of 23 percent, the global percentage that women make less than men. (Hansen, 2017). 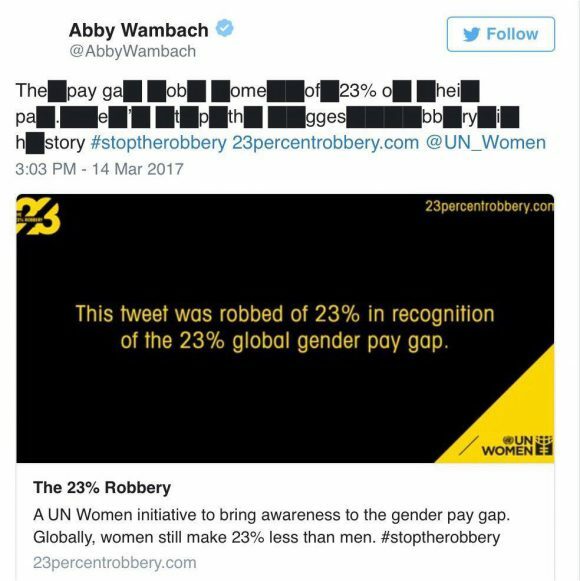 You can join the discussion by tweeting information about gender pay gap, but the information you tweet has 23 percent of it taken out. It’s a strong visual reminder that we can’t have clarity without equality. (Hansen, 2017). The way that the UN works with social media for the event, inviting people to take part and share their own experiences really reflects how we want to engage with politics today. A studie from Parmelee and Bichard (2013) show that people who follow political leaders on twitter wants to see more than just the latest updates. Followers wants to be involved, get an inside perspective and be a part of a two-way communication, to be able to get their voices and priorities heard. Parmelee, J.H; Bichard, S.L (2013). Politics and the Twitter Revolution. How Tweets Influence the Relationship between Political Leaders and the Public. Plymouth: Lexington Books. This entry was posted in Feminism and tagged CONTENTIOUS POLITICS, CSW61, Donald Trump, Feminism, Gender, StopTheRobbery, UNWomen, Women´s Forum. Bookmark the permalink.